Your hotspot for Costco deals. 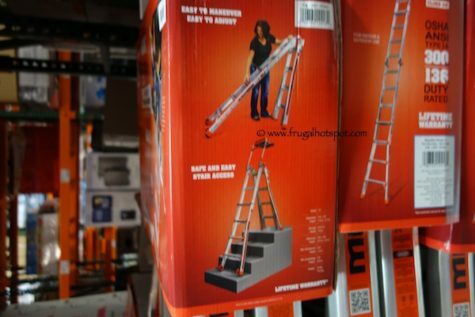 Costco has the Little Giant MegaMax M17 Ladder on sale for $139.99 (after instant savings), now through March 3, 2018. That is $40 off Costco’s new regular price of $179.99. While supplies last. Price and participation may vary by location. 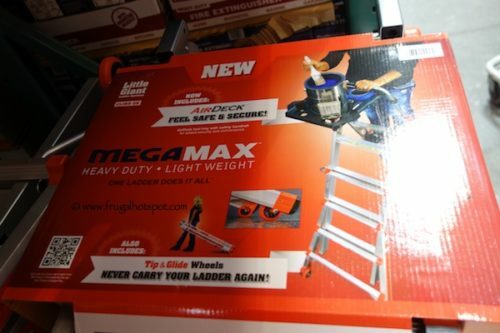 The MegaMax ladder combines the strength, safety and versatility of the classic Little Giant Ladder with several new features, including accessory portals and the AirDeck tool tray and safety handrail. The safety handrail gives you an added sense of security on the ladder and can even prevent that shaky, uncertain feeling of vertigo many feel when working at the top of a ladder. Each side of the MegaMax ladder telescopes independently, giving you the option of setting the stepladder from 4 to 7 feet. You can also adjust one side to work on staircases and uneven surfaces, or as a 90-degree stepladder. The Triple-Lock hinge allows you to use the ladder as a stable, wide-based, multi-height extension ladder. The inner and outer ladder assemblies separate to form two trestles for a scaffolding system. The Little Giant MegaMax meets or exceeds all OSHA and ANSI standards and is industrial rated up to 300 lbs. Item #787841. This product was spotted at the Covington, WA location. Price and participation may vary so it may not be available at your local Costco or it may not be on sale at your local Costco or it may be a different price at your local Costco. Prices & sales dates may change at any time. This is just a posting of a deal and not an endorsement or recommendation of any product or of Costco. Please do your own research before making any purchase. Thanks for supporting my blog! Next Costco Coupon Book: July 10, 2014 – August 3, 2014. Prices Listed. Costco Coupon Book: APRIL 17, 2019 – MAY 12, 2019. Prices Listed. Enjoy the deals? It would make my day if you got me a coffee! Disclaimer: This blog is NOT affiliated with Costco. I do not work for Costco and I do not receive any free products from Costco. These deals and sales are while supplies last and may not be available at all Costco locations. Check you local Costco before you go.